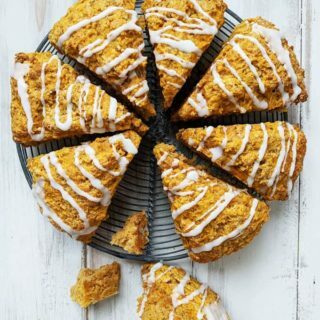 These Pumpkin Spiced Scones are a third of the Points value of the ones sold in Starbucks at this time of the year! 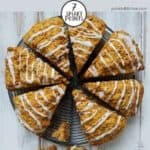 Each sweet and tasty scone is 7 SmartPoints on Weight Watchers Freestyle / Flex plan. 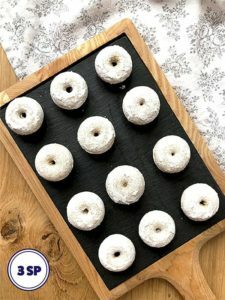 They are moist, light and delicately spiced with a drizzle of sweet icing glaze topping them off perfectly! 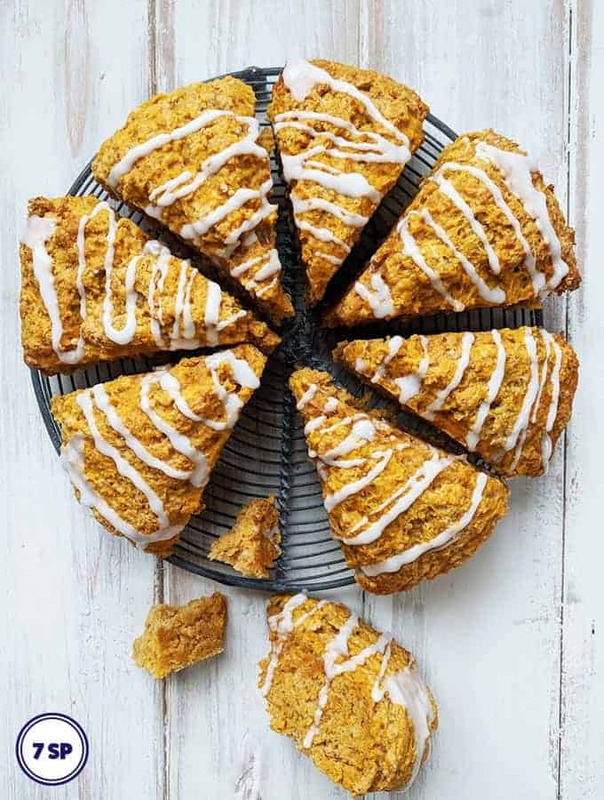 I’ve never seen these wonderful Pumpkin Spiced Scones in any of the European Starbucks. Have you? However, I’m lucky enough to travel to North America on a pretty regular basis, where at this time of year everything turns to pumpkin spice. My last visit just happened to coincide with Starbucks restocking their shelves with these fantastic tasting scones. I ate one or two but at 22 SmartPoints per scone, I really questioned whether they were worth it! They taste divine, but 22 SmartPoints! That’s almost my daily Point limit. I gained a couple of pounds after that visit to North American – so no, they probably weren’t worth it! So, I’ve been playing around with scone recipes trying to come up with something similar. I think I’ve eventually created a pretty damn good copycat version! 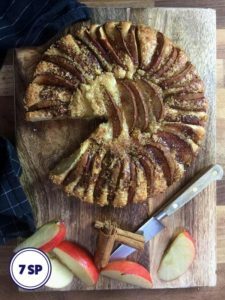 They are moist and light and delicately spiced with cinnamon, nutmeg, cloves, allspice and ginger. 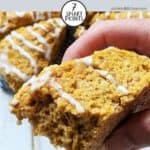 They don’t have the thick layer of icing that the original Pumpkin Spiced Scones do, but remember they are 15 SmartPoints less than the originals!! Just look how good that looks!! Use a knife to combine the flour and spread (pic 2). Usually for scones you would use your fingers to rub in the butter to the flour, but it just becomes a sticky mess when using low fat spread. Use the knife to cut through the mixture again and again until it resembles breadcrumbs. Add the pumpkin mixture to the flour mixture (pic 3) and use a spatula to fold them together. Don’t over mix – you are only folding the mix together so that when you start using your hands, they don’t become covered in pumpkin puree. Use your hands to bring the mixture together (pic 4) so it is just combined (pic 5). Using a knife score the disc of dough into 8 equal pieces (pic 7). The dough is sticky so you won’t get a clean score but doing this will make it easier to cut the scones once they are baked (pic 8). Once the scones have cooled, you can use a sharp knife to cut them into the eight individual triangles (pic 9). Lastly, once cooled completely you can drizzle the scones with some glaze. I go on about these Silpat Non-Stick baking mats quite a bit on this site! That’s because they are amazing! They are available in a number of different sizes from Amazon. I used a silicone spatula, like this one to get all of the precious dough from the bowl! If you liked this recipe for Pumpkin Spiced Scones you may also like these recipes! 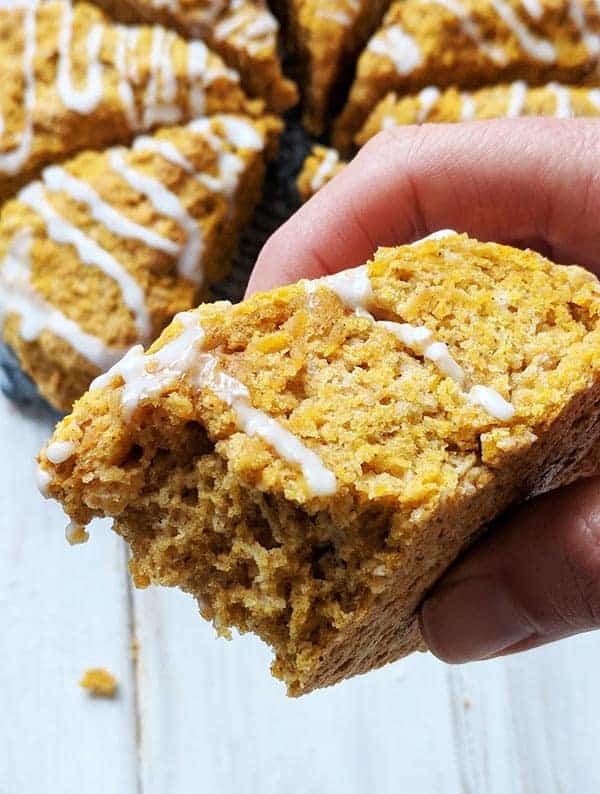 These copycat Starbucks Pumpkin Spiced Scones are 7 SmartPoints per scone. Using a fork, combine the pumpkin puree, egg and yogurt in a bowl. Set aside. In a medium bowl combine the flour, sugar, baking powder, salt and spices. Add the low fat spread and using a knife cut through the mixture again and again until the mixture resembles breadcrumbs (using your hands to do this, as you would with traditional scones, will make the spread melt). Add the pumpkin mixture to the flour and mix with a spatula until the mixture is just coming together. You don't want to over mix at this stage. Use your hands to bring the mixture together. Place the dough on a baking sheet which has been lined with a piece of baking parchment or a silicone mat. Very gently create a disc, about 1 inch thick, with the dough. Bake for 20 - 25 minutes until the scones have risen, are firm to the touch and have started to turn golden brown. Remove from the oven and let them cool for 10 minutes. 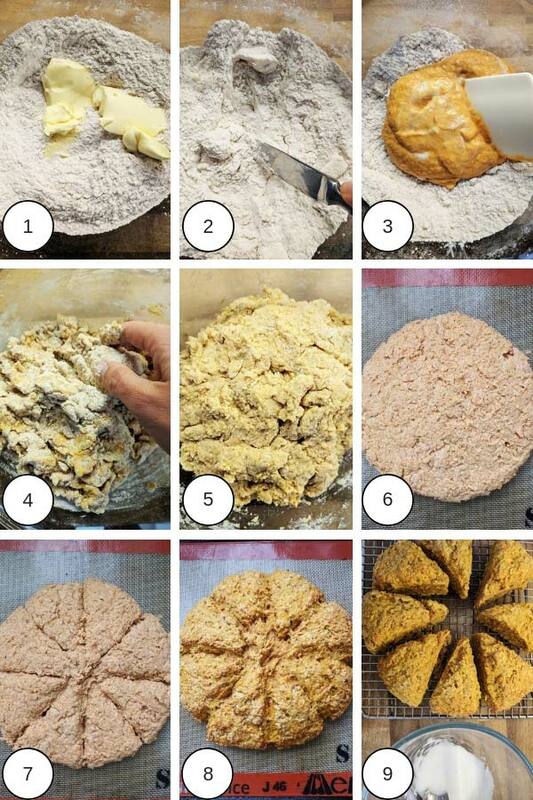 Cut through and place the 8 scones on a wire rack to cool! When the scones are cool you can make the glaze by adding one teaspoon of milk to the icing sugar / powdered sugar. Mix and add more milk bit by bit until you have the consistency that you require. I find that 2 tsp is adequate.